If you've never been to Alaska, you're missing out on a treasure trove of beauty. I've been several times, and no matter how many times I visit the same places and see the same sights in this beautiful state, I always come away shocked by its magnificent sights. 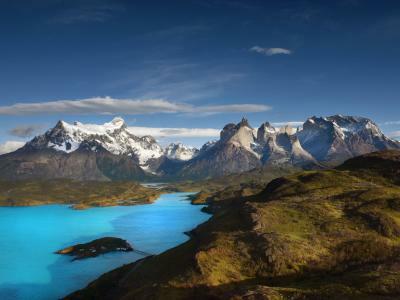 Of course, Alaska isn't just a hotbed for landscape photography. It also offers abundant opportunities to photograph wildlife as well. When it comes to Alaska wildlife photography, there are few experiences as exciting as photographing grizzly bears. 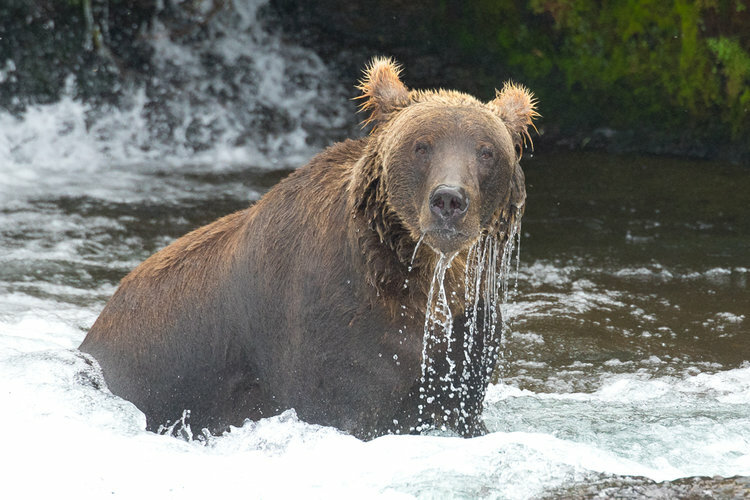 Here are a few essential tips to keep in mind when photographing bears in Alaska. Editor's Note: The images in this article are by our friend John Slonina and are used with permission. Close calls with wildlife happen all the time, and unfortunately, it sometimes ends with a photographer or an animal being injured or killed. When photographing Alaskan grizzly bears, it's important to keep your distance, particularly from mother bears with cubs. Additionally, having protection from bears is essential, either in the form of bear spray, a firearm, or both. Venturing out into the Alaskan wilderness on your own is not a good plan, either. Instead, to photograph bears safely, it's recommended to join a photography tour, that way you not only have safety in numbers, but you also benefit from having an experienced guide that knows the area (and knows the bears, too). One of the most basic wildlife photography tips is to have two camera bodies, each with a different focal length lens, charged up and ready to go. 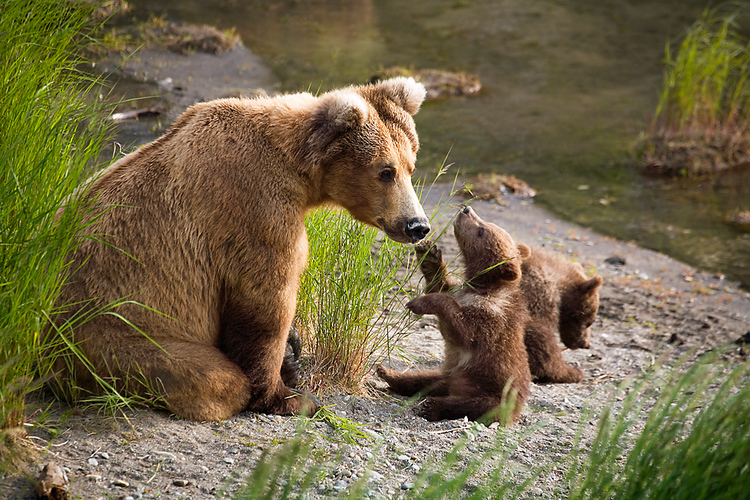 By having two bodies, you can shoot wider shots with one for environmental-type portraits of bears and close-up, more intimate shots with a longer lens that shows the detail of these beautiful animals. This will enable you to get more shots, more quickly. 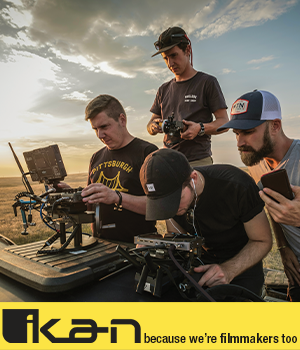 Additionally, without having to constantly change your lenses, you'll be part of the action instead of missing critical shots because you're in the middle of a lens change. One of the keys to a great photo of a bear is to get on their eye level. For one, this helps the viewer see the world from the bear's perspective, which, depending on the bear's position (laying down, standing up, etc.) 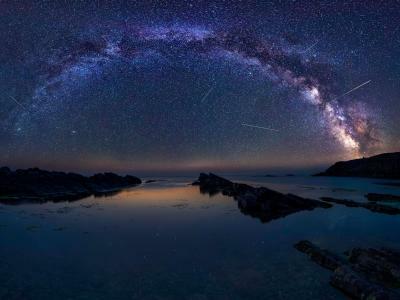 could be much different from what we see from a typical human eye level. Secondly, getting on the bear's eye level makes the photos you take much more dynamic. 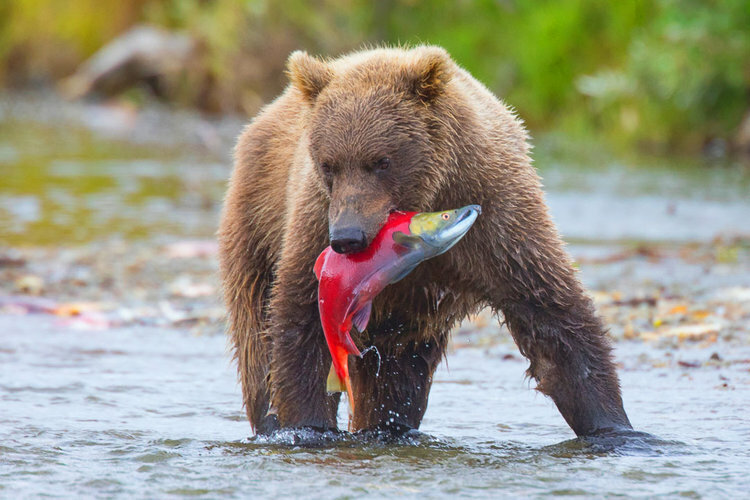 Think about it - if you're photographing a grizzly fishing for salmon, the image will have more impact if you kneel or sit down than if you shoot from a higher perspective, downward towards the bear. Just like shooting a portrait of a person, by focusing on a bear's eyes from its eye level, you'll end up with a much more satisfying photo. Bears are constantly on the move, and as such, you need to dial in the right camera settings to keep up with all their movement. That means using continuous autofocus so that your camera is constantly adjusting its focus as the bear moves around. That also means setting up back-button focusing so that you can use the shutter button to meter and a button on the back of the camera for focusing. Using a fast shutter speed is critical as well. Bears might seem like big, slow animals, but that's simply not the case. They can be lightning-quick, so you don't want to end up with blurred motion because your shutter speed is too slow. Though different situations call for different shutter speeds, 1/500 seconds is usually a good starting point for daytime shooting. 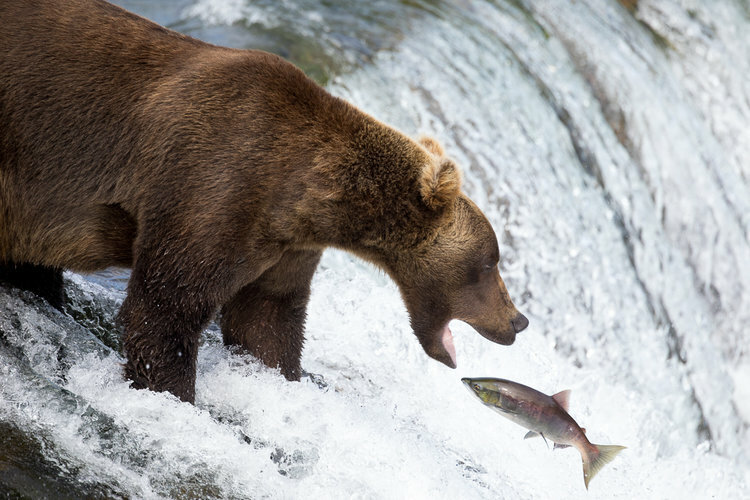 Of course, your success in photographing bears in Alaska begins with doing your homework. You'll want to research grizzly bears to learn about their habitat, their behavior, their diet, where they live, and so forth. 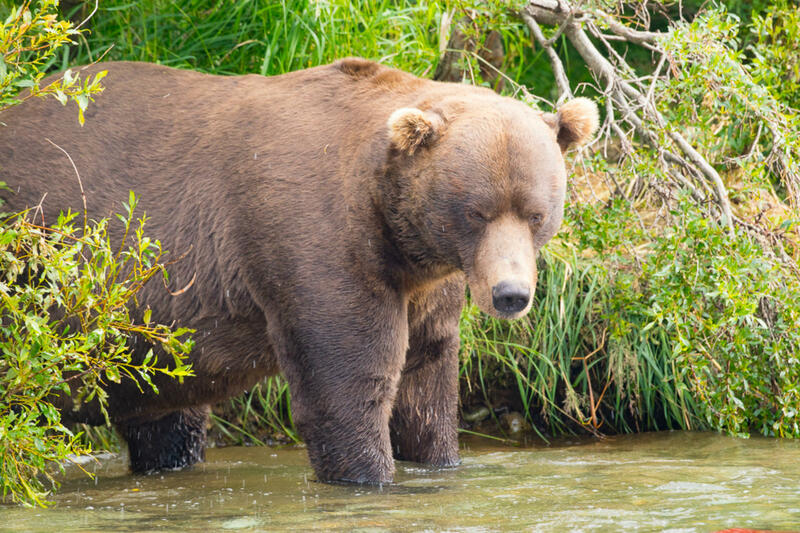 Additionally, understanding when salmon runs occur, when bear cubs are born and are most active, and how to get to prime bear territory are musts as well. As noted above, though, visiting Alaska to photograph bears is best done not on your own, but as part of a photography tour. Not only do photo tours take care of the planning aspect of photographing bears, but with seasoned photographers at the helm, you'll also have a chance to learn more about how to photograph bears. 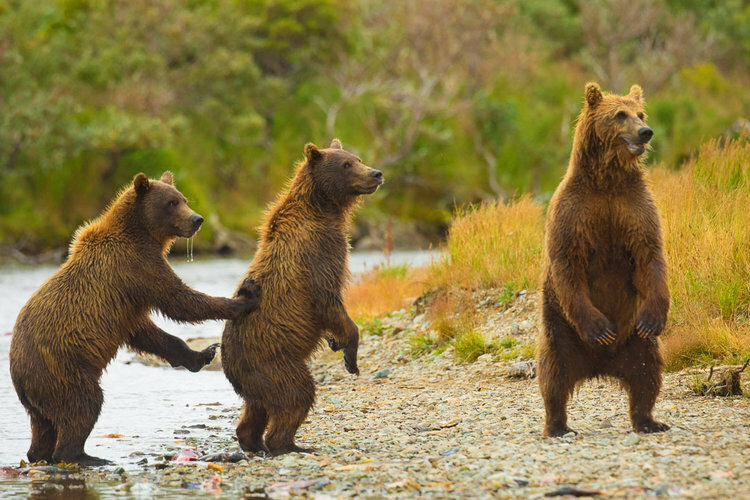 Slonina Photography offers one such bear photography tour. While there are other tours that focus on photographing grizzlies, what sets Slonina Photography apart is that you travel by floatplane to various locations. 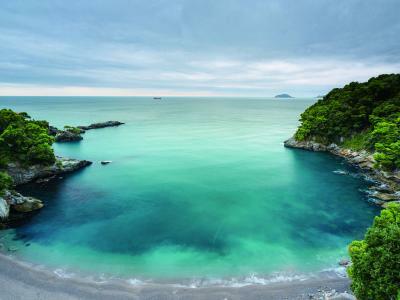 That includes Katmai National Park, which sprawls over four million acres in southern Alaska. It has one of most dense bear populations in the world (about 2,200 at the National Park Service’s last count). 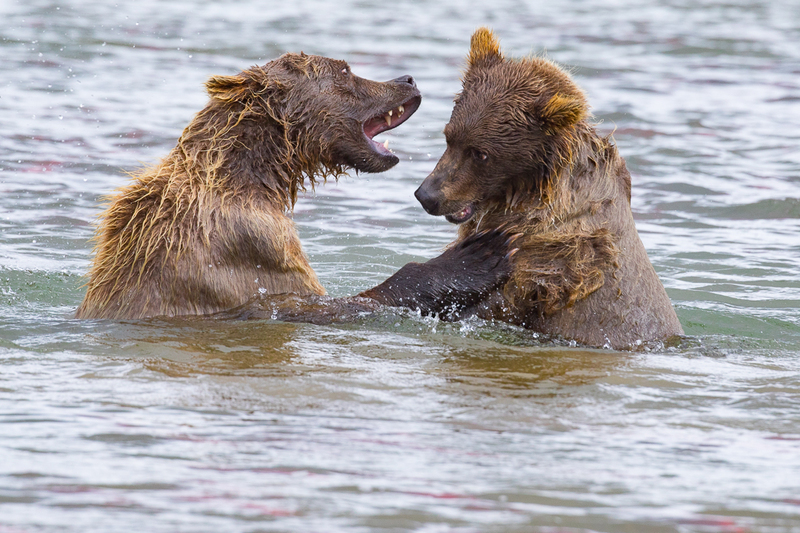 Slonina Photography takes you to several different locations at Katmai. They are not stuck with the same bears and the same background. Instead, they have the aforementioned planes to take you to different locations, that way every day you can visit different bears with different scenery. One day you may have a bear on a waterfall, the next day bears fishing in the river with a mountain or glacier in the background. The next day may be bears digging for clams in the ocean. Variety is key with several options to explore at this incredibly beautiful national park. By monitoring several sites for bear activity, this allows the tour to visit the best places at the best times, that way you get your money's worth when it comes to getting photos of these beautiful animals. 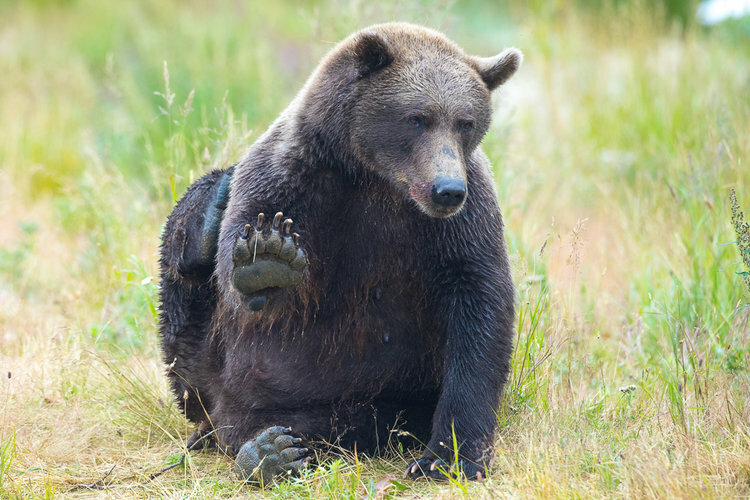 What's more, this tour includes workshop time during which you will learn about bear behavior so you can get high-quality action photos of bears playing, fighting, fishing, and so on. After each day's adventure, there is downtime at a lakeside lodge where you will learn about post-processing techniques for enhancing your images. There's also time to share and critique images, thus enhancing the educational component of the trip. In other words, bear photo tours and workshops like this one offer the full experience, with access to photography experts, bear experts, and seldom-seen bear habitat. 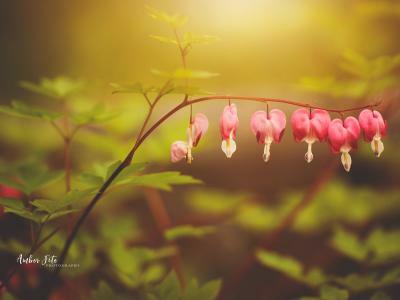 That's why there's only one spot left for the upcoming photo tour August 7-13, 2018! You can register for the final spot here or get on a waiting list. Another tour is scheduled for July 16-21, 2019.